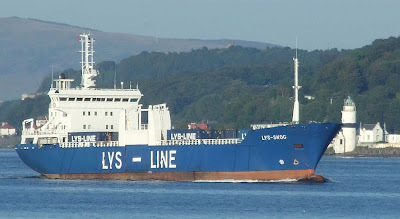 After spending just a few hours at Greenock (she arrived from Belfast this morning) , the paper carrier LYS-SKOG sailed again tonight for her next port. While on the Clyde, she had discharged a cargo of newsprint. Part of her specialised cargo-handling gear can be seen on her starboard side.